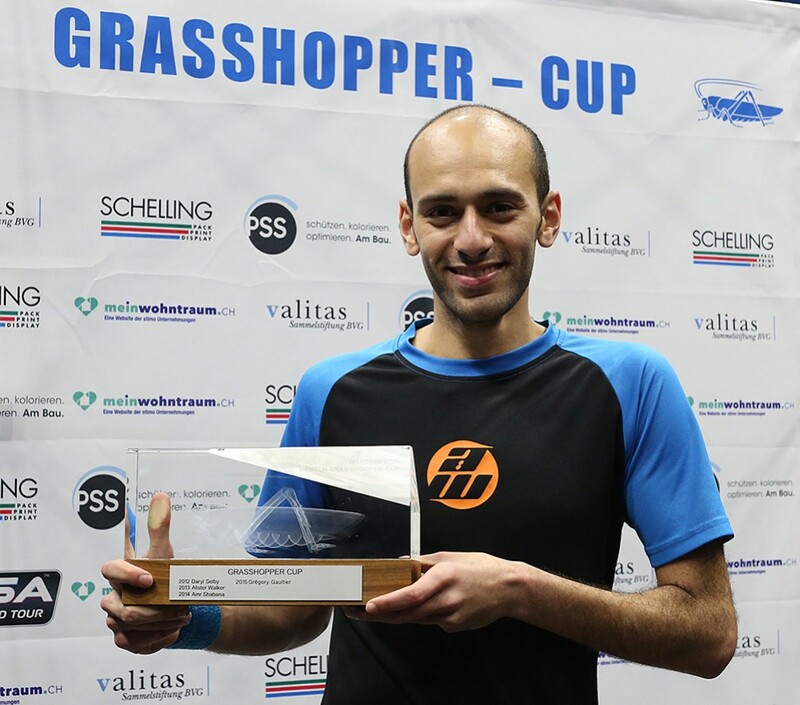 22-year-old Egyptian Marwan ElShorbagy emerged victorious in the finale of the 2016 Grasshopper Cup to defeat French World No.2 and 2015 tournament winner Gregory Gaultier to lift the biggest title off his career to date and record his first ever win over the current World Champion in the process. 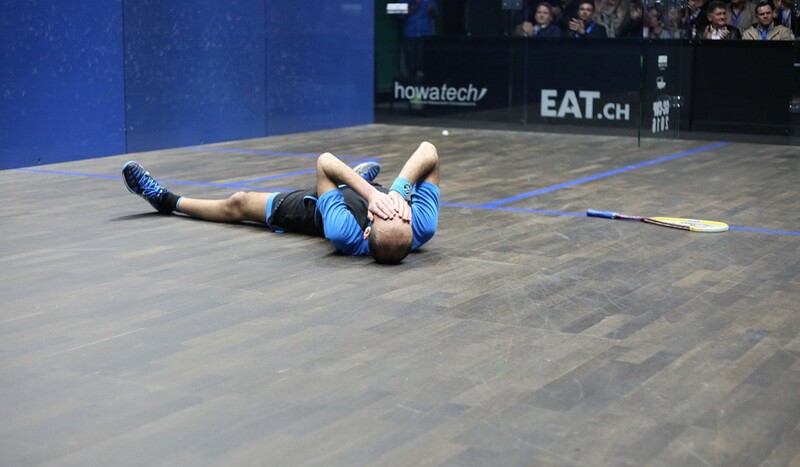 In front of a capacity crowd inside Zurich's Puls5 ElShorbagy, who had reached the final without dropping a single game, faced off against Gaultier in a match the 33-year-old was expected to win having won all three previous meetings between the pair - with ElShorbagy never having taken a game from the 'French General'. True to form it was Gaultier who took the early impetus as he nullified the Egyptian in the opening game, taking it 11-6, but in the second game the match was flipped upside down as ElShorbagy upped his levels to pressure the Frenchman and gain a foothold in proceedings. After taking the second 13-11, ElShorbagy then found himself ahead after taking the third 11-9. 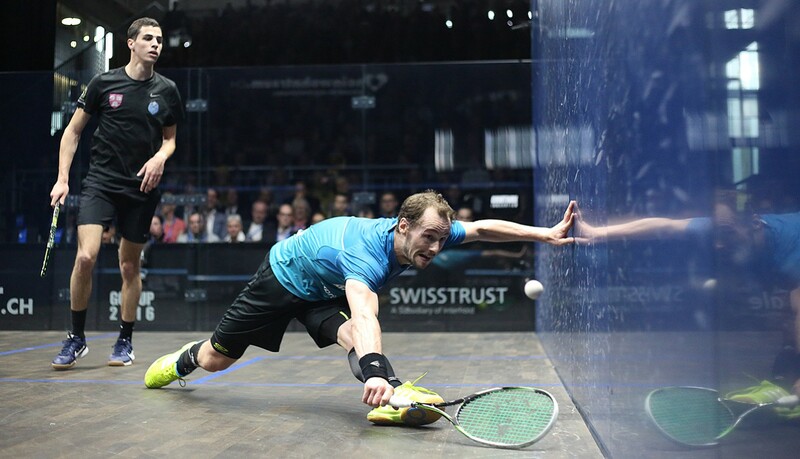 Gaultier found himself on the defensive during the fourth and managed to edge ahead at the business end to force a decisive fifth game but it was ElShorbagy who commanded it, playing relaxed, attacking squash to seal the biggest win of his life. "This is the biggest win of my career - I'm not sure what to say - I'm just over the moon," said ElShorbagy. "To beat the World Champion is something I will never forget. I've been training very hard recently and there have been a lot of people, coaches, friends and family that have been pushing me and their support is vital. "I loved every single second of being here and it was a great tournament. 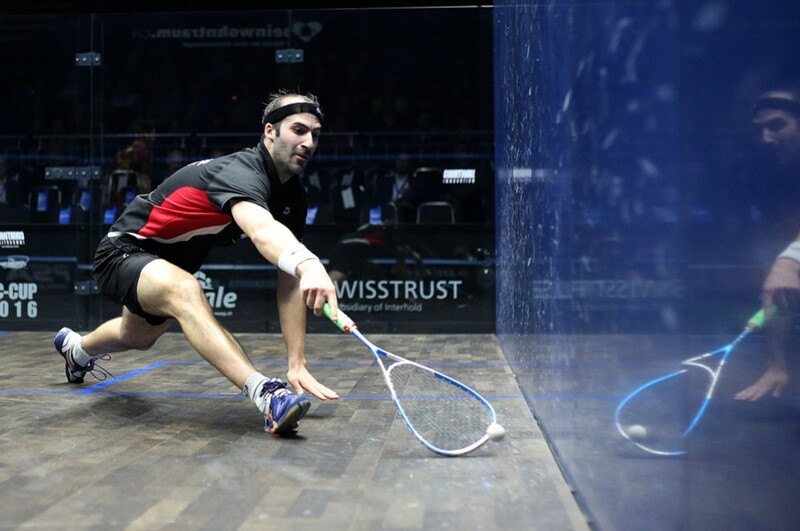 Squash is nothing without the crowd and they have been excellent this week and I can’t wait to be back here next year." 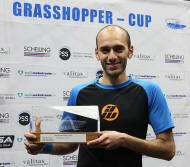 The 2016 Grasshopper Cup final will see 2015 champion Gregory Gaultier (left) aim to defend his title against Egyptian World No.12 Marwan ElShorbagy after the duo came through their respective semi-final encounters against Ali Farag and Simon Rösner, respectively, inside Zurich's Puls5. A capacity crowd watched on as current World Champion Gaultier produced a masterclass performance to see off the very dangerous Farag 3-1 as he shot of the blocks, playing with pace and intent from the first exchanges in what was a high quality opening game that went the way of the Frenchman 11-5. After quickly doubling his lead Gaultier was guilty of a lapse of concentration in the third which allowed Farag, who cut a frustrated figure on court as he searched for a way through the World No.2, the chance to attack and get himself back into the game but after squandering game ball in the fourth Farag could only watch on as Gaultier surged back to keep his title defence alive. "I think I played quite well today and I was moving well which really helped me," said Gaultier. "I think the match yesterday helped give me some rhythm which helped me today. He's already a top class player - he's ten years younger than me. "I lost my focus a little in the third and I maybe got too greedy and tried to go short to early. I had to get my basics back in the fourth and it was a matter of just a few crucial points in the end. I'm happy with the performance and the way I am moving - I felt today was the first time I was moving well without any pain after the injury." 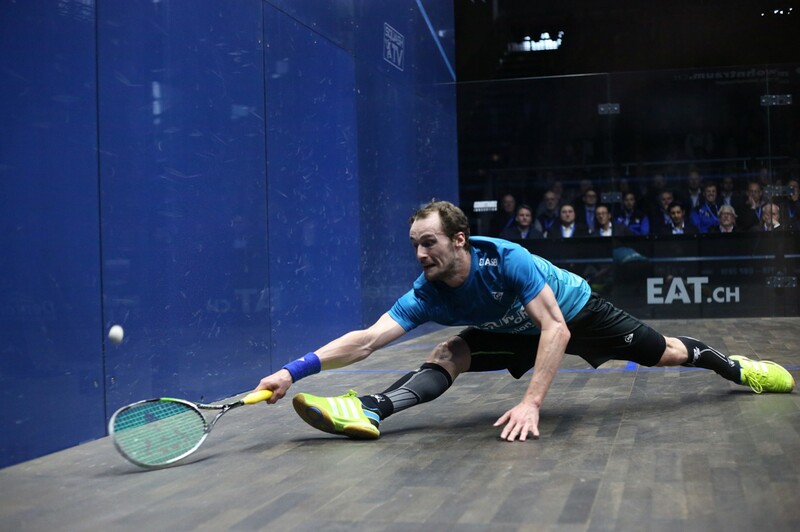 Gaultier will now face ElShorbagy in what will be the fourth meeting between the pair, after the Egyptian saw off Rösner, the 2015 runner-up, 3-0 to move into the final without the loss of a single game after over 140 minutes of action. ElShorbagy (right) put in a controlling performance to make life difficult for the powerful German who was struggling to back up from his gargantuan efforts to down Gregoire Marche in an 86 minute quarter-final as ElShorbagy played with patience to extend the rallies in the opening game and force Rösner into an arduous physical battle which paid dividends. "I tried to make the first game as long as possible and that worked in my favour today," said ElShorbagy. "It was a long game and I think it took a lot out of him and I got more confident throughout. I'm pleased with how I have played here, I haven't dropped a game do far but there's still one match to go so I'm going to give it my all tomorrow. "Greg is the World Champions - he's a great player. Every time I go on court against him I make the most of it - I enjoyed it today and I want to keep enjoying being on court and loving every single second on court and that's the plan for tomorrow as well." Local hero Nicolas Müller's dreams of Grasshopper Cup glory were abruptly ended by defending champion and World No.2 Gregory Gaultier (left) in Zurich tonight during a high class evening of quarter-final action that also saw German Simon Rösner come through a titanic 86-minute battle with Frenchman Gregoire Marche. After watching home favourite Müller bow out to Gaultier the capacity crowd inside Puls5 were on the lookout for a new favourite and made their voices heard during the all-European battle between Marche and Rösner, which was jam-packed with lung-bursting rallies from that off that had both players scurrying around all four corners on the court at a ferocious pace. Despite playing at a supremely high level throughout the encounter, including taking the first game, Marche couldn't do enough to stop 2015 runner-up Rösner coming through 9-11, 11-6, 11-9, 16-14 in the match of the tournament. "I think that was one of the toughest matches that I have played," said Rösner. "Every time I thought he was tiring he came right back at me and it was an amazing battle but I'm super glad to come through in four. I'm really pleased to be in the semis - after reaching the final last year it is a good achievement to be back in the last four for me. "He pressured me a lot in the first and was making em do a lot of work and putting me under pressure. I had to really focus on hitting the corners from the second onwards and I think that ultimately made the difference at the end. "I need to do what I can now to get back on court tomorrow as fresh as possible." Rösner (right) will now face Egyptian Marwan ElShorbagy in the semi-finals after he downed Cameron Pilley 3-0 while Ali Farag, who beat Chris Simpson, awaits Gaultier after his comprehensive win over Müller. After coming through a thrilling first round encounter with Ryan Cuskelly to set up the last eight battle with Gaultier Müller couldn't find anything in his locker to halt a surge from the current World Champion and went down 11-4, 11-2, 11-7 in just 37-minutes. "It is always tough to play against the local boy - at the end of the day I have to do my job and I was moving better today than in the first round," said Gaultier. "I had to be very aware of his skills. He had a tough first round match and was maybe a bit drained from that and I took full advantage to counter him and dictate the game. "Sometimes we travel to places and it can only be players and refs at the first round so it's great to play her win front of a good crowd so it's good to see Switzerland embracing squash." Former World No.1 James Willstrop suffered a shock first round exit during the 2016 Grasshopper Cup as he fell to a straight-games defeat at the hands of Frenchman Gregorie Marche (left) inside Zurich's Puls5 earlier today. 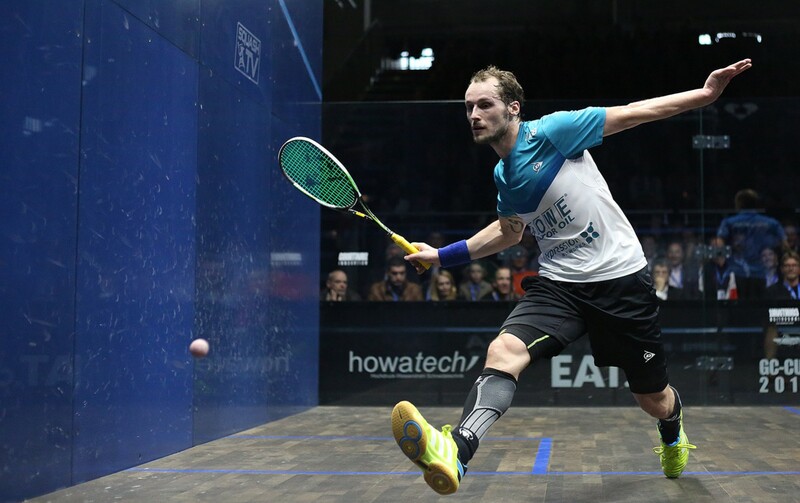 The Englishman, who has won 19 PSA World Tour titles, was under par from the off and Marche took full advantage to open up the court and make life difficult for Willstrop. The first game was arguably the best of the match as the duo traded points in a series of high class exchanges, but it was Marche who moved ahead from the mid-point stage and from then on Willstrop never truly looked like he would be able to find the killer blow to put Marche away as his movement was exposed time and again. "James has been World No.1, he is one of the best players out there so I knew it would be tough," said Marche. "I'm really happy to beat him for the first time. I had to be accurate with my length and not allow him to volley. I don't think he was 100 per cent but I had to make him work and stay focused until the end and use my speed so I'm very happy with that win. "I had to take a few weeks out myself to recover from a niggle and I'm happy to be back playing again now and happy that I can move like I did today." German Simon Rösner (right), the number two seed and last year's runner-up, stormed into the quarter-finals in the last match of the second day as he dismissed New Zealand's Paul Coll 3-0 to set up a quarter-final match with Marche. "I was on my toes all the time because he's a very tough competitor," said Rösner. "I knew it would be tough and that's exactly what it was. I'm pleased to come through in three because you never want to get into a fourth or fifth game with him because he never stops. "I tried to change my tactics a bit today because I think my game is suited to him so I'm very pleased I managed to stick to the plan today. "I'm in a position where I have to defend a runner-up finish which isn't easy but I think I play better with pressure." 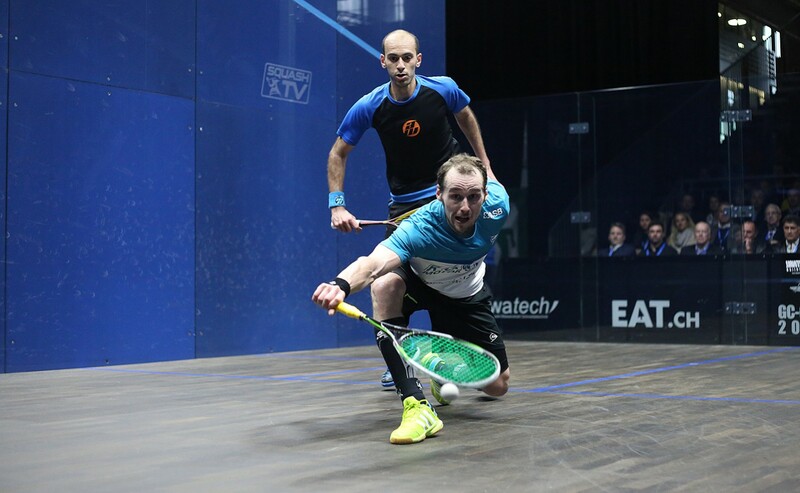 The other winners on the second day of competition were Marwan ElShorbagy, who downed Scotland's Alan Clyne 3-0, and Australian Cameron Pilley who came back from the brink of defeat against Adrian Waller to secure his passage to the quarter-finals. Pilley began the encounter in sluggish form and was quickly facing down the barrel off a first round exit but in the third he began to play with improved length, finding his targets in the back court more frequently to level the playing field. The fifth started with Waller back in control to open up a 6-1 lead but again Pilley dug in and upped his game to reel off 10 unanswered points and save his hopes of success here in Zurich. "I think that was tough mentally (to come back from 2-0 down) especially because he beat me last time we played and I wanted to get revenge for that," said Pilley. "But he played really well in the first two games and I was flat - I had nothing. It was a matter of playing a lot smarter in the third, fourth and fifth and I'm proud of the comeback and I think I finished the match quite strongly. "It's great to have big crowd here on the first round it is something we really appreciate it so it;'s great to be here and come through." 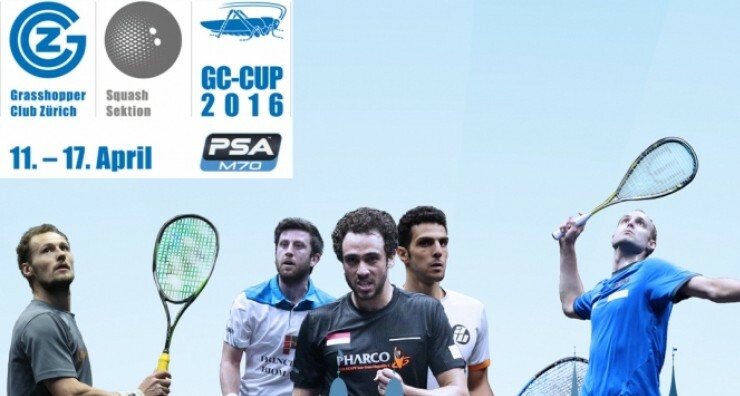 Local hero Nicolas Müller came through an epic battle with Australian Ryan Cuskelly, ranked fifteen places above him on the World Rankings at No.16, to delight a capacity crowd and move into the quarter-finals of the 2016 Grasshopper Cup, the PSA M70 tournament taking place in Zurich's Puls5 venue. 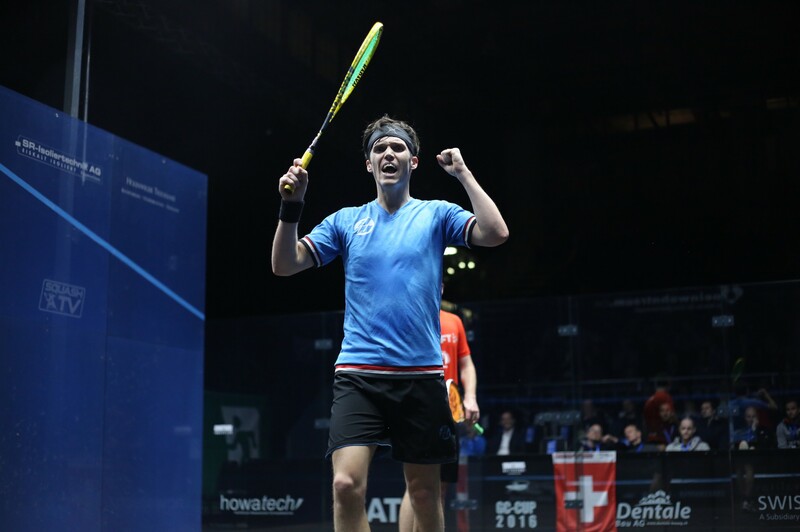 Müller (left) lost out in the first round last year after an agonising battle with Ramy Ashour but this time he was on the winning side of a gargantuan encounter, coming through from 2-1 down after 95 minutes of thrilling squash to win 10-12, 11-8, 9-11, 11-8, 11-7. Müller started strongly but saw his early first game advantage wiped out as Cuskelly came from behind to take the early ascendency but with the crowd behind him Müller staged a remarkable resurgence in the fourth game and held his nerve in the fifth to seal a huge win - his first main draw win on the PSA World Tour since January. "The atmosphere was amazing here last year when I lost to Ramy but it was even better tonight and the crowd just pushed me so much, I don't think I would have been able to do it without them," said Müller. "The first game I was up and had game ball and even though I lost I knew I had made him work a lot and in the third I was feeling good and the crowd was a huge push." "I'll go away and prepare myself for a big battle now on Friday." Müller will now face defending champion Gregory Gaultier (right) in the last eight after the French World No.2 began his bid to win the tournament for a second consecutive time with a 3-1 win over Malaysian qualifier Nafiizwan Adnan. The current World Champion didn't have it all his own way against Adnan and was forced to work hard from the off against the tenacious 29-year-old before showing his class to come through 11-8, 9-11, 11-9, 11-5. "We've played a number of times and today I think he played the best that he has against me," said Gaultier. "I was struggling to find solutions and find my length but sometimes you have to deal with these things. I did what I could today and managed to get the win and I think we gave a good show for the fans. "Last year was my first time playing here and I enjoyed it and won. I promised to come back so I wanted to live up to my word." On the first day of action debutant competitors Ali Farag, who downed Leo Au, and Chris Simpson (left) were the other winners, with Simpson securing an impressive 3-0 win over top ten ranked Frenchman Mathieu Castagnet. "Mathieu and I are the same age but that was only our second match on the PSA World Tour so it was nice to play him as it was a new challenge," said Simpson. "The last time we played he beat me in five and I was two-up and those kind of matches scar you and you don't forget them. He's made a massive surge in the rankings recently and been playing very, very well and I'm trying to chase that and today I was very happy with how I played. "I started a little slow but after I woke up I felt like my game was on form and my tactics worked well." Scotland's Alan Clyne led all four top seeded players through the final round of qualification at the 2016 Grasshopper Cup, PSA M70 tournament taking place in Zurich, Switzerland, courtesy of an impressive straight-games victory over Dutchman Laurens Jan Anjema. 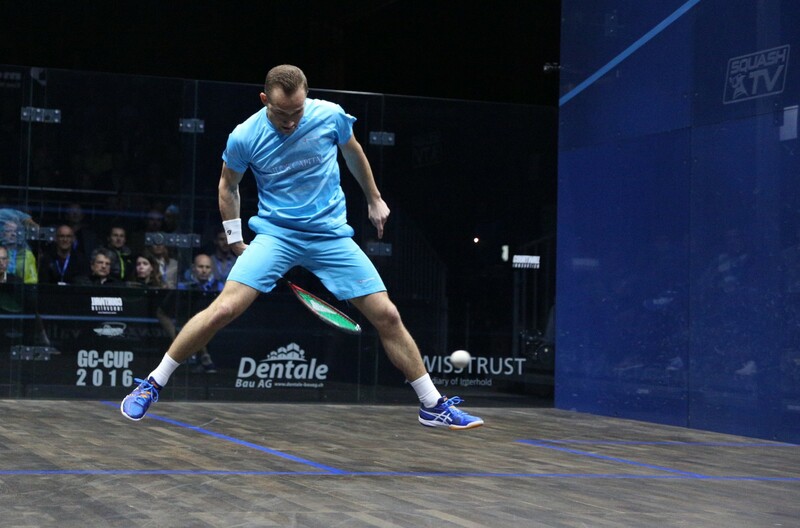 Clyne came from behind in the opening game against the former World No.9 before producing a masterclass performance, utilising his drop shots and length to nullify Anjema's threats and set up a main draw encounter with Marwan Elshorbagy. “Finishing the first game from 7-9 down was crucial today,” said Clyne. Top seeded Adrian Waller came through his final qualification battle with Campbell Grayson 3-1 to set up a first round encounter with Cameron Pilley, while Malaysian Nafiizwan Adnan will take on defending champion Gregory Gaultier after downing Kristian Frost Olesen after a 61-minute battle. “At 10-6 In first I lost concentration so it was a bit of a wake up call,” said Adnan. 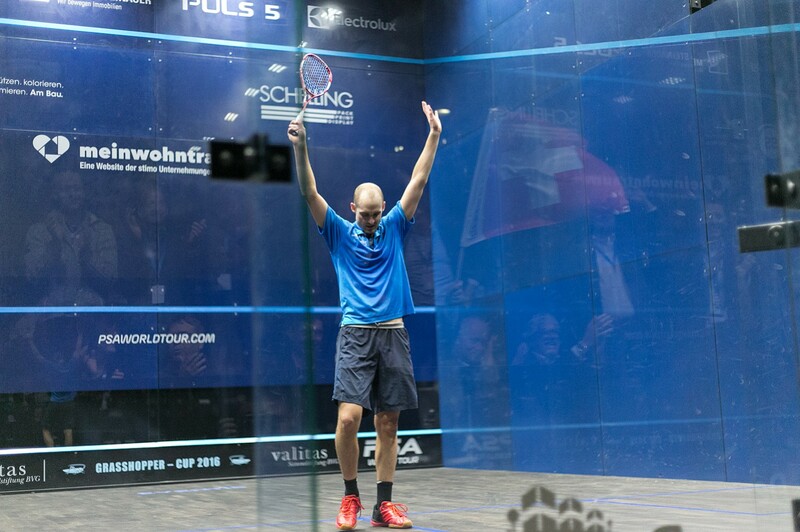 The final berth in the main draw was taken by New Zealand's Paul Coll after he saw off the dangerous threat of experienced campaigner Olli Tuominen. 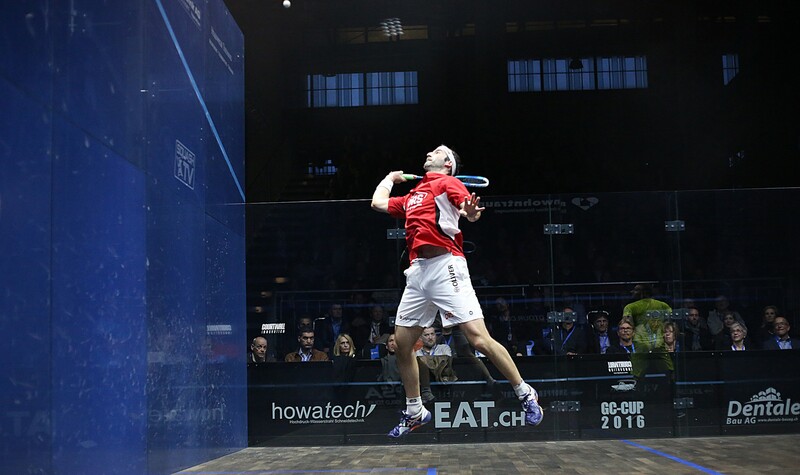 “I felt good out there today and played positive squash in the first two games,” said Coll. 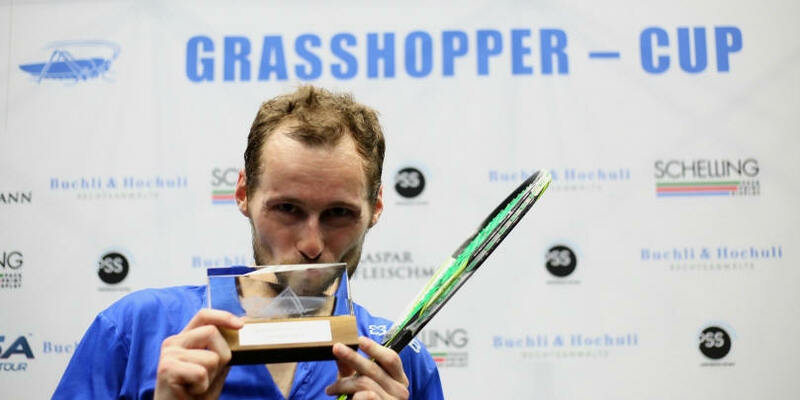 2015 World Champion Gregory Gaultier will headline the 2016 Grasshopper Cup, PSA M70 tournament as he attempts to defend the title he won last year when the event gets under way on Wednesday April 13 in Zurich, Switzerland. The charismatic Frenchman ended years of World Championship heartbreak when he finally triumphed in November but an injury sustained two months later at the J.P. Morgan Tournament of Champions has seen the World No.2 out of action ever since. Second seed Simon Rösner, who lost to Gaultier in last year’s final, is also challenging for honours in a draw that features eight of the world’s top 15 players with luminaries such as France’s Mathieu Castagnet, Egypt’s Marwan Elshorbagy, Australia’s Cameron Pilley and England’s James Willstrop all present in a highly-competitive and multinational draw. Gaultier is seeded to meet compatriot Castagnet in the semi-final while Rösner and Elshorbagy could face off in the other last four fixture. “We are delighted to once again welcome a superb draw to Zurich and look forward to the breathtaking fixtures that have become synonymous with this tournament,” said Tournament Promoter Steve Buchli.